Slime Ghosts are slimy, green, glowing entities of unknown origin that can be found in Flatbush. They are capable of speaking, spreading and taking control of people's bodies. They can be defeated with proton packs, such as the ones used by the Slime Busters. Slime Ghosts are seen in one episode, the The Super Mario Bros. Super Show! live-action segment, "Slime Busters". Several Slime Ghosts have invaded Mario Brothers Plumbing at some point and are giving Mario and Luigi more trouble than they can handle. As one Slime Ghost pulls Luigi into the back room, Ernie Hudson of the Slime Busters shows up and goes on a quest to hunt any Slime Ghosts he can find. Ernie eventually finds one in Luigi, who has, unknown to them, been possessed by one while he is in the back room. 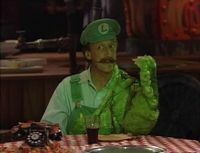 While Ernie and Mario search for traces of Slime Ghosts, Luigi takes a bite out of his plate, followed by part of his body turning into slime. With no other choice, Ernie is forced to shoot Luigi and is held with the risk of tuning him into a zombie if something went wrong. Although Luigi tries to deflect Ernie's proton shot with a pizza pan, Ernie succeeds in ridding him of the Slime Ghost. The now-dented pizza pan is possessed by the Slime Ghost, however and asks for Ernie to take him away from Mario and Luigi, whom he refers to as "Goombas". 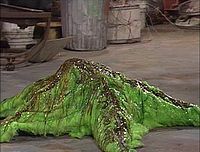 Slime Ghosts are based on the character of Slimer from the Ghostbusters series. This page was last edited on April 7, 2018, at 09:16.